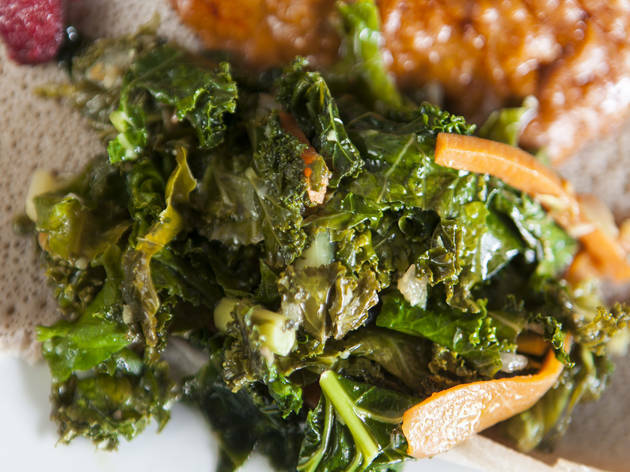 When shrimp-and-grits staple Mama Joy's bowed out of Bushwick, it made way for a restaurant with roots touching even farther south: Ethiopia. 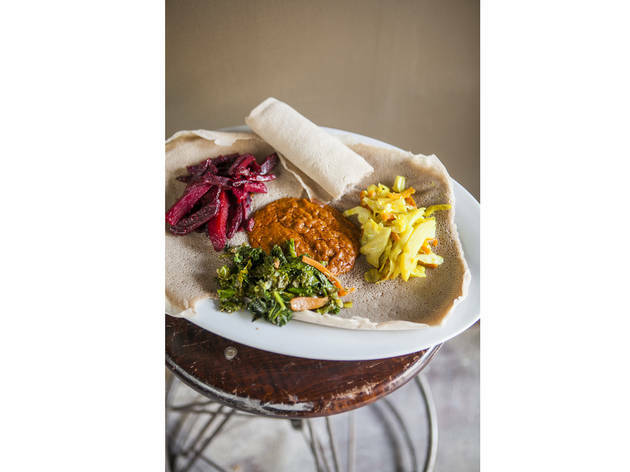 Founded by Sam Saverance and Ethiopian expat Liyuw Ayalew, the wandering vegan pop-up—running in North Brooklyn since 2011—hosted African lunches out of Mama's vacant space starting in July 2013 and has since moved in permanently. 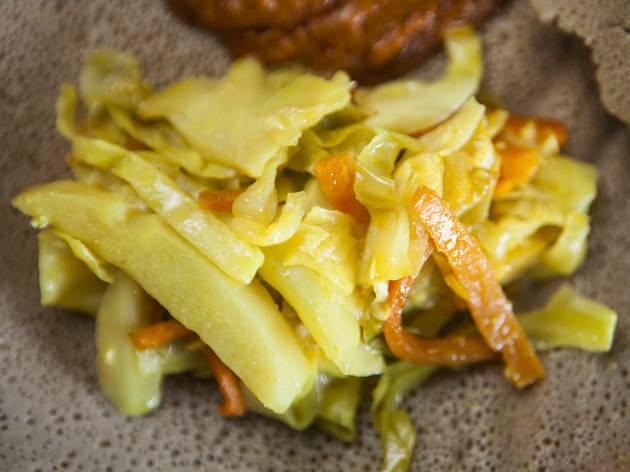 The brick-walled joint honors Ethiopia—widely hailed as the birthplace of coffee—with traditional coffee ceremonies and live Abyssinian music. Java is made in a jebena pot and infused with cloves and cardamom, served with snacks like ambasha bread or cooked barley. 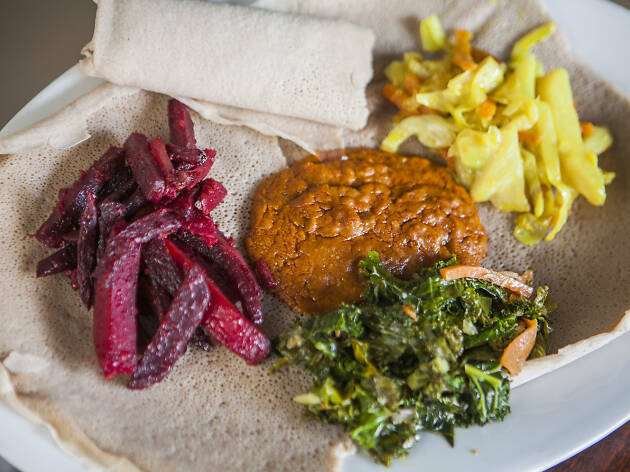 Those looking for heartier options can dig into vegetarian plates, served on a bed of injera bread, like misir wot (red lentils in berbere sauce), keysir selata (sautéed and chilled beets) and shiro (garlicky ground chickpeas). Along with pureed juices (mango-avocado-papaya), beverages include Ethiopian beers (Castel, Harar), tej (honey wine) and cocktails, such as a whiskey-spiked Shai spiced tea. Exposing Deception: BEWARE the FEAST for 3! The short story: The feast for 3 (priced at $ 14 more) has exactly the same amount of food as a feast for 2, except one extra injera bread (that is priced at $1) is added. Essentially, you are paying $14 for an extra injera that you could just get instead for $1. In other words, DON’T ORDER THE FEAST FOR THREE! It’s a waste of your money. The long story: My husband and I were thrilled when Bunna Cafe popped up on Caviar under Ethiopian that could be delivered to our house. Yes! Finally! 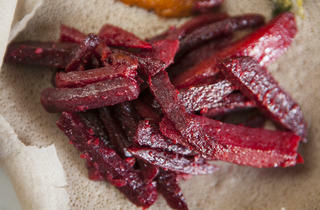 On this past Saturday night we ordered a feast for 2 (priced at $37) and an extra injera bread ($1) and reveled indeed. The spices were blended, the flavors complex and our bellies satiated. Even our sixteen month old dug in (quite literally, cute little fingers covered yellow in delicious Yater Kik Alicha) with excitement and joy. The vote was unanimous, the golden doodle also agreed, that Bunna was a keeper and one to be added into the rotation (of our not-so-great-but-heavy-ordering-in-a-lot habit). Last night we had a guest over and when the time came to suggest a place, Bunna Cafe rolled off my tongue with ease and confidence. Only four days since our discovery, but why not! Good food speaks for itself. We were delighted when we found you could order a feast for 3 (priced at $51) at $14 more than a feast for 2 (priced at $37). For $14 more, I thought we’d certainly get more vegetables than the feast for 2, and of course an injera or two more (for $1 or 2 - they are priced at $1 each). Imagine my surprise when the EXACT SAME amount of food came, with the exception of just one extra injera (we’d also ordered an extra for $1 but that’s a non essential characteristic of this telling). Same box, same containers, same amounts in the containers; the only difference, one more $ 1 injera (essentially priced at $ 14). Family hold back time, big time. I immediately called the restaurant to speak to the manager. When this kind of error has happened in the past, the more honorable places that value customer feedback and honor the relationship building aspect of the hospitality industry begin by accepting responsibility and then seek to make amends and rectify any error that is reasonable. Sam, the manager of Bunna Cafe, was patronizing and arrogant, verging on facetious. He kept saying he was “trying to understand” what the problem was. 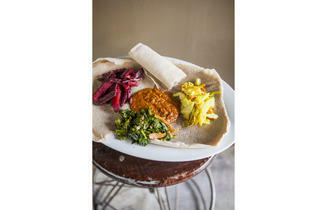 The problem is Bunna Cafe gives the exact same amount of food for $37 as $51, but only add an extra injera worth $1! 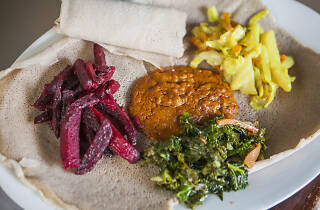 After a back and forth that yielded more discomfort and fury than a sense of my concerns truly being heard (and far from assuaged), he said, “but isn’t there more injera”? Yes, 1 for $ 1! After trying to speak to him (with constant interruptions and interjections from him) I tried to ascertain if the restaurant is AWARE they serve the same amount of vegetables in the exact same containers. Yes. They are. He added casually that they add “one extra spoon of vegetable” in each container. I have a good gauge of how much food I’m given (I can often predict from the “weight” of the ice cream container compared from the night before weather or not my husband had a cold midnight snack, haha!) and this was NOT any extra than what was given us on Saturday night. Do they really tell the server who dishes out these feasts that “this is a feast for 2 vs. a fest for 3?” I doubt. Essentially 3 vs. 2 is loosely determined qualitative measure that might or might not be conveyed to the person filling the containers. Sam said he’d send a feast for 1 (that would have made sense, since we ordered a feast for 3 but actually got a feast for 2) but did not honor his word. No feast for one arrived. Sam (not literally him) was a no show. If only the owner can own up to this discrepancy in price and quantity and make a quantitative increase in regards to both the vegetables and injera, I see hope for the longevity of this restaurant. If they knowingly cheat their customers, and consciously short us, I see this as a deception, and a fight I’m willing to fight. I write this review for you today, to inform you with full disclosure of this shortcoming. I hope that the owners of Bunna have more integrity than Sam and are able to make amends that reflect an honest customers sincere concerns. And while they are doing that, give young Sam (sure, being a little ageist here) a swift slap on the wrists for his utter lack of even an iota of managerial integrity and discernment. The food here is amazing, but what makes Bunna Cafe stand out is its drink menu. From traditional Ethiopian honey wine to cocktails infused with the Cafe's unique coffee, this is a great place for dinner and drinks with a small group. It can get a bit loud, so be prepared to shout across the table, but the experience here is totally worth it. This place has a line out the door on a Tuesday night. That goes to show how incredible it is!! 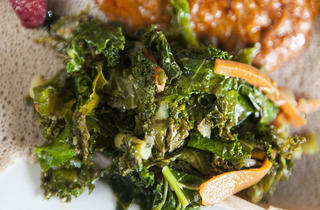 Best vegan food in Bushwick, and at a reasonable price, too! One of the best Ethiopian restaurants I have ever been to. The service and atmosphere are fantastic, the coffee ceremonies are great and it's all vegan, which is an added bonus. 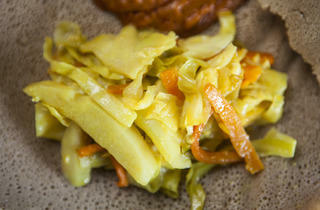 Simply put: this is Ethiopian food at its best. It's one of the few places both you and your non-vegan compadres can appreciate. 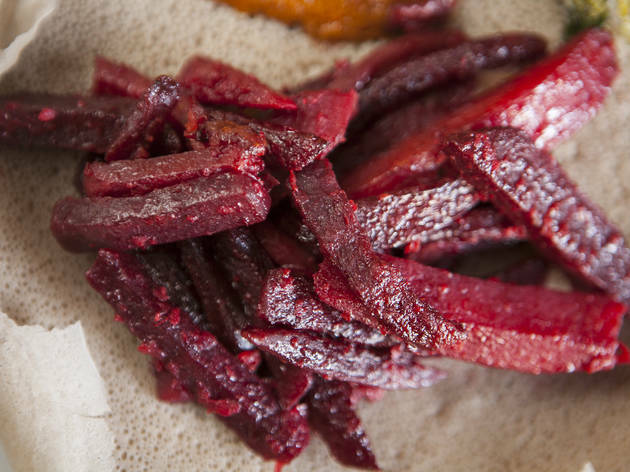 At Bunna, eating is best thought of as a team sport; groups of friends huddled around tables hand-picking colorful dishes from oversized Injera-covered plates. The casual atmosphere and low prices make this a spot worthy of many repeat visits. Come for a coffee ceremony or order some out-of-this-world T'ej (Ethiopian honey wine) to complete your trip to the horn of Africa. I'll second bigmovie's thoughts. They could double their prices and I would still come.